FOLKESTONE. — The ROYAL NATIONAL LIFE-BOAT INSTITUTION has formed a Lifeboat station at Folkestone, in accordance with the wishes of the local residents, as an additional safeguard for life-saying purposes for that part of the coast, the adjacent Life-boats being Dover on the east and Hythe on the west, and there being considerable steamboat and other traffic in and out of Folkestone Harbour. 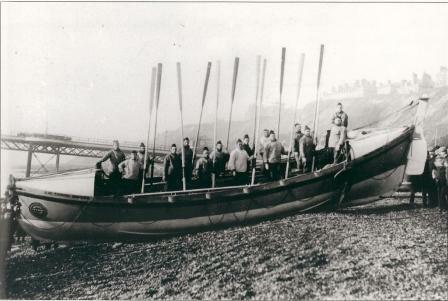 The Life-boat provided is 38 feet long, 8 feet wide, and rows 12 oars double-banked; it is fitted with three water-ballast tanks, provided with plugs and pumps, by means of which water can be readily admitted or pumped out; it also possesses the latest improvements, with all the other characteristics of the boats of the Institution in the way of self-righting, self-ejecting water, etc. Like all the modern self-righting Life-boats built by the Institution, this boat will promptly self-right if capsized with all the crew and gear in, masts up and sails set. It is furnished with a transporting and launching carriage well suited to the purpose, and a commodious house has been erected for their reception on the beach near the New Pier. The cost of the boat, carriage and equipment has been defrayed by Miss CURLING, of Denmark Hill, London, and as desired by her the boat is named the J. McConnel Hussey. On the 25th July last the formal inauguration of the new Life-boat establishment took place in the presence of a large concourse of spectators. The Mayor and Corporation and the invited guests assembled at the Town Hall, and proceeded thence to the beach adjoining the Lifeboat house. The Mayor wore his chain of office, and the Town Sergeant his gorgeous Louis XIV uniform, and carried the ponderous mace. The Vicar of Folkestone, with his curates in their robes, the organist and choirmaster of the parish church, and the choir, all in their surplices, were stationed at the bow of the boat, and the Corporation and officials gathered round her. In the course of his opening remarks, the Mayor referred in terms of gratitude to the munificent gift received from Miss CURLING, and regretted that the state of her health precluded her from being present on that auspicious occasion. 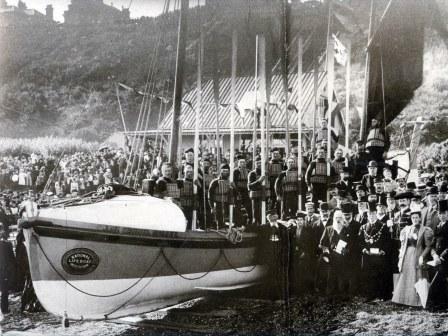 In her name he handed over the boat to the District Inspector of Life-boats, Commander T. HOLMES, R.N., as representing the ROYAL NATIONAL LIFE-BOAT INSTITUTION, and expressed the hope that it would be a great success, although he trusted that it would be many years before it would be wanted. If it should be, he felt sure that the brave men who formed the crew would do their utmost to save any lives which might be in danger (applause). The gift was acknowledged in suitable terms by the District Inspector, who then transferred the boat to the care of the Col. STEPHEN PENFOLD, J.P., undertook that it should be found efficient in time of need. Miss VAUGHAN, the daughter of the Mayor, then performed the naming ceremony, after which a religious service was conducted by the Rev. Canon WOODWARD. The appropriate hymn, "Eternal Father, strong to save," was sung with striking effect by the choir and the assembled spectators, and the benediction concluded the service. 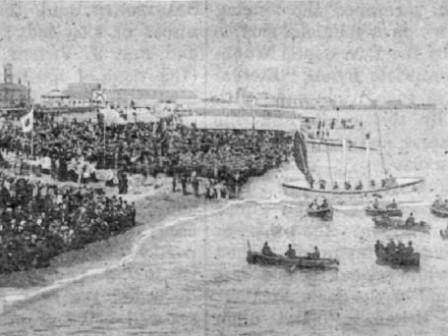 At a given signal the rope which held the boat was loosened and she glided smoothly and quickly into the waves, as shown in the annexed illustration, amidst ringing cheers, while several rockets were fired, and the band of the Scots Fusiliers played "Rule Britannia" and other appropriate airs. The pier and the beach were gaily decorated with flags, and quite a fleet of boats were on the sea waiting for the Life-boat to join them. In the evening the Life-boat crew were entertained at the Albany Restaurant. The Mayor also invited the members of the Corporation and several of his friends to a private dinner at the Pavilion Hotel. Extract from “The Lifeboat Journal” Volume XV, Number 174, November 1894.
boom, and a no.1 rig, the overall weight 4 tons 3 cwts. which was donated by Miss Curling of London. While at Folkstone 4 launches took place and 10 lives saved. experiments. Returned to London for fitting out. and reduced to 10 oars instead of 12. Placed in the relief fleet as a trials boat known as R2A. surveyor of lifeboats, new wood casing fitted. further 6 launches and saved another 3 lives. COMMENTS : Inspected and prepared for the sale list.